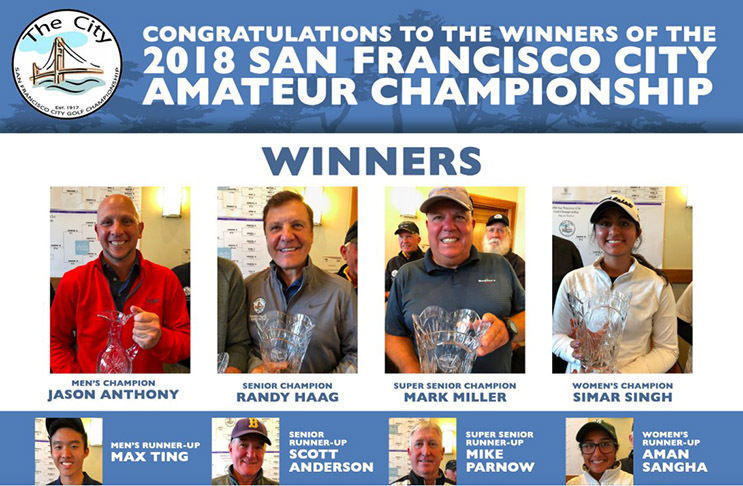 SAN FRANCISCO, California (March 18, 2018) — Over two weeks ago, top Bay Area golfers began their campaigns to earn the prestigious and storied title of San Francisco City Golf Champion, an honor sought after by local greats like Johnny Miller and Ken Venturi, as well as by visiting collegiate talents like Tom Watson who tried his luck in the event during his years at Stanford. For the 102nd year in a row, “The City” has delivered a company of worthy champions. Breaking through to win his first SF City Championship title, Jason Anthony, 34, was able to get the best of his young opponent Max Ting in Sunday’s 36-hole final match of the 64-man match play event. Anthony, who had been trying to end the match for some time, was able to finally finish 18-year-old high school senior on the par-3 17th. A product of Bay Area golf and a quarterfinalist in last years event, there were few in the field more deserving of a win this weekend then Jason “Old Man” Anthony. In the Senior division, Randy Haag defeated Scott Anderson, closing the match 4&3 with a win on the par-4 15th. The 2018 senior champion and part-time golf blogger is no stranger to success on the Harding fairways, with wins in both the senior and men’s championship divisions in 2016 and 1999 respectively. This victory, however, follows what was a tough year at Harding Park in 2017 for Haag. Today, all was forgiven for Haag, who is once again taking home the trophy of the tournament that he calls the most important tournament in his life, a big statement coming from a guy who has played in 38 USGA events, including seven U.S. Amateur Championships and three U.S. Senior Opens. For Haag though, the Bay area is home, and there are few better places to be known as the champ than among your own. In the Women's Championship, Los Altos High School senior Simar Singh was able to hold off Aman Sangha, former Cañada College team captain and recent Portland State commit. The two went 33 holes before Singh closed out the match, 4&3. “We’ve been playing with each other since I was eight years old and she was maybe ten. I respect her game so much, and she is a great competitor and a great friend,” said Singh of her opponent Sangha who is just a few years older. Like Sangha, the 17-year-old Singh will also be heading to the Pacific Northwest this fall, where she will begin her college career playing Division I NCAA golf at the University of Oregon. In the Super Senior division, Mark Miller scored a 4&3 win over Mike Parnow to add a Super Senior title to the Senior championship he won in 2011. In the Open Flights, the winners were: Tyler Burnes (Ken Venturi Flight), Matthew Fegley (George Archer Flight), Abi Vickram (Mayor Ed Lee Flight), Brad Payne (Sandy Tatum Flight), and Naputt Aroonchaipirom (Ray Pelligrini Flight).